Home / Affirmatslifestyle / Exploring Wisdom: What Are You Truly Hungry For? Exploring Wisdom: What Are You Truly Hungry For? Are you feeling well-nourished right now? This week? This past month? What does feeling nourished even mean to you? Think back to the last time you felt a sense of ongoing well-being in your life, with a resilient pool of resources to navigate the inevitable ups and downs of life and these particularly stressful times. A sense of wellness, of being okay, of being able to rest in the present moment with grace, ease, and joy. The kind of nourishment I am talking about is not only from quality food, water, rest, and movement but nourishment of the whole self, including the physical, emotional, psychological, social, creative, intellectual, and spiritual aspects of ourselves. In today’s fast-paced world we have even more reasons to disconnect from our bodies and what we really need at any moment. The ways our days, schools, and workplaces are set up generally do not encourage self-care as a value or provide systems that support it. We lose contact with ourselves through the external focus of getting things done, meeting deadlines, and spending large amounts of time in linear indoor spaces that do not nourish us with beauty and harmony. The constant bombardment of media from all our devices can leave us feeling hopeless or helpless, draining us of the energy we need to nourish ourselves, others, and the planet. The quick fixes are all around us, including caffeine to keep us awake and alert; fast food and drinks high in sugar, salt, or fat; and TV or mindless eating to numb out with at the end of a long day. What does it take to stay strong, centered, and attuned in the midst of these societal forces and structures? We can use the image of a water lily, which is rooted firmly in the soil hidden beneath a pond. A water lily is gently buffeted by the flows of water that stream past, as currents change from wind, storm, and passing visitors such as turtles and fish. Throughout it all, the lily stays rooted in the ground, swaying with grace, drawing nourishment from soil, sun, and water, and open to the sky. Mindfulness helps us to tune into what we really need moment to moment. You can check in periodically throughout the day and ask yourself what kind of nourishment you need right now. You can notice what thoughts and feelings you are bringing to the literal or figurative table. Are you truly physically hungry, or is there something else you really need, masquerading as a desire for food? Are you present for the nourishment and enjoyment from your food when you do eat? Do you pause and remember to savor the moments of your life? The first step is to learn ways to quiet the mind enough to see what is truly present. You can bring mindfulness into the moment by practicing a mindful pause—take a few deep, relaxing breaths, then allow it to return to its natural rhythm, gently focusing on its movement. Next, broaden your awareness to include thoughts, feelings, and physical sensations. Inquire into your experience with curiosity and kindness. Insights and new perspectives may arise. You may also begin to experience a greater sense of being. With time it will get easier to notice when you are ignoring or misinterpreting your inner signals for nourishment. Remember to give yourself permission to regularly stop, be still, and listen. The nourishing choice may be to eat mindfully, or it may be to take a walk in nature, or express or feed your creative, social, or intellectual self. It may be to simply remember who you really are beyond all your cravings. This vast pool of compassionate awareness and clear seeing grows with mindful practice. Mindfulness, self-compassion, and lovingkindness practice are tools along this journey. They teach us to listen, move gently and skillfully, and respond appropriately like the lily. They help us to connect with our own goodness, to know we are worth it, and to set intentions for deep nourishment. Research shows that the more we practice self-compassion, the more we increase our own self-care and the more compassionate we become to others. Ask yourself daily, “What parts of myself have I attended to today?” Listening and responding is an act of kindness not only to yourself but to all those around you. 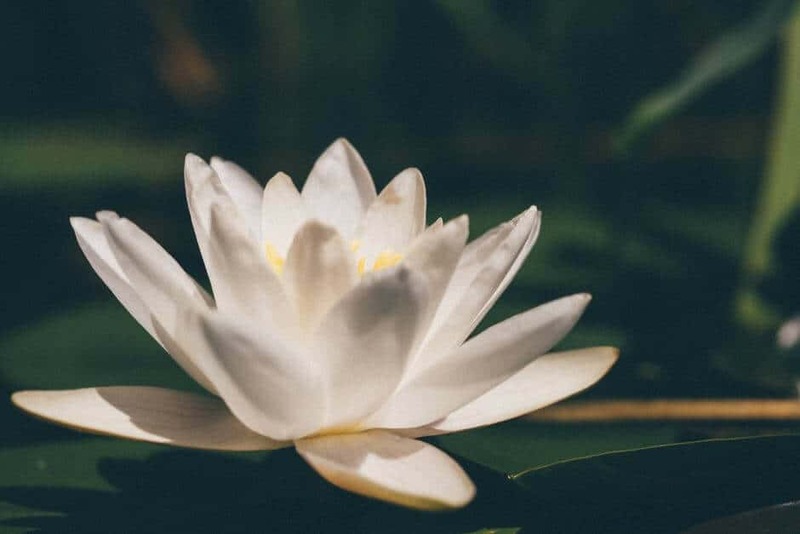 At first it may take extra energy, intention, education, and discernment to learn how to be rooted and open like the water lily, connected to the deep nourishment, with all the resources you need to flourish. With practice it becomes a way of living and being, navigating the multitude of choice points we have each day and savoring each moment. Andrea Lieberstein, MPH, RDN, RYT, is a mindfulness-based registered dietitian, mindfulness meditation and self-compassion teacher, mindful eating expert, and author of Well Nourished. She has an upcoming retreat at Art of Living Center called Cultivating True Nourishment, July 6-8, 2016.